View the reflective OLED screen outdoors with the Convergent Design Sun Hood for Odyssey Monitor. This solution is a sturdy plastic hood molded specifically to fit the Odyssey monitor and recorder. It mounts with screws and covers the top and sides of the Odyssey 7/7Q/7Q+ OLED screen. The hood is designed to protect your screen in the field and reduces strong light reflection. The hood folds flat for storage and the bolt design is such that the hood can be placed directly on top of the Odyssey without scratching the screen. Box Dimensions (LxWxH) 6.6 x 5.1 x 1.4"
Sun Hood for Odyssey Monitor is rated 4.7 out of 5 by 10. Rated 5 out of 5 by MindFuel from Convergent Design Odyssey 7/7Q Cun Hood Well made. A hard rubber shade that is not flimsy, nor will it crack. Great design. It screws on, so it will not off. Allows easy access to all connections. Rated 5 out of 5 by Daniel from Best SunHood out there for the 7Q Attaches quickly to the 7Q monitor/recorder and stays put, yet if bumped into something it gives and does not break. This still allows access to all of the I/O ports and buttons. Love that it folds up flat and can be stored anywhere. Highly recommend this one. Only grip, pretty expensive for molded rubber. Best value would have been around $-, oh well. 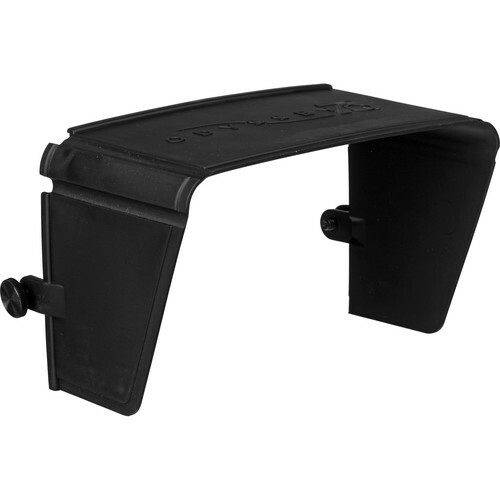 Rated 5 out of 5 by GMaster-E from Odyssey Monitor Hood Relatively expensive sun hood for Convergent Design's Odyssey family (7/7Q/7Q+) fits perfectly and mounts securely with 2 screws. If you've ever had to fiddle with someone's velcro-secured sun hood, you will appreciate this molded rubber version all the more. Highly recommended. Rated 5 out of 5 by Austin from A must have for the 7Q+ I love this sunhood. In fact I use this hood on my Odyssey 7Q+ over the Wooden Camera hood. It screws to the side bolts and is very rigid. Works perfectly. Note you do however lose the side 1/4-20 holes for mounting when in use. Rated 3 out of 5 by andrew c. from i might buy again It's a pretty good product. Shooting in Florida, where it's extra bright, it would be nice to have a bottom on it to cut glare. It does make it easier to access menus though. Fit could be a little better around the top. Rated 4 out of 5 by GC from NYC from Best option available Locks in easily. Feels durable and sturdy. Folds flat. Wish it was a bit cheaper, and that Odyssey offered a larger one covering the whole screen.